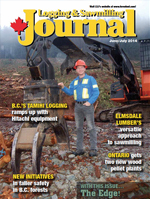 Tamihi Logging’s Jesse Dorman is keeping busy these days, operating in the Fraser Valley, east of Greater Vancouver. With the help of some new Hitachi equipment, Tamihi Logging will harvest around 400,000 cubic metres this year. (Photo by Paul MacDonald). Though they may not be high profile, B.C’s privately managed forests are quietly going about contributing to a sustainable—and productive—forest land base in the province, but they still face their own set of challenges. B.C.’s Tamihi Logging is one busy operation these days—harvesting upwards of 400,000 cubic metres a year—and it has made some significant investments in new iron the last several years, including four Hitachi ZX290 Forester log loaders. 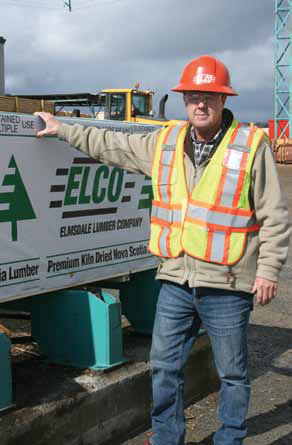 Nova Scotia’s Elmsdale Lumber has been around for close to 100 years, and their focus on employee involvement and engagement, as well as running a versatile sawmill, is a big part of the reason for that longevity. Darrell and Robert Ophus started out modestly in logging equipment with a single skidder, but the brothers now have 19 pieces of equipment to harvest 280,000 cubic metres of mostly beetle wood for forest company Canfor in the B.C. Interior. Foundation (WOLF) and Alberta Innovates Technology Futures. Rentech Inc. has invested $90 million to convert two mothballed Ontario forest products plants to produce wood pellets using a state-of-the-art stationary flailing and microchipping system from Continental Biomass Industries. New initiatives are being taken to increase the safety of fallers in the woods, but some of B.C.’s longest-working fallers—who have achieved incident-free 40-plus-year careers—say one of the major things a faller can do is simply keep his head in the game, and stay focused on the job at hand. Sustainability and biodiversity as they relate to forest management are heads and tails of the same coin, says Tony Kryzanowski, and forest sustainability is an environmental dead-end without biodiversity. Elmsdale Lumber is looking forward to celebrating an important milestone in just a few years. The sawmill enterprise was established in 1917 by the Wilber Family in the community of Elmsdale, Nova Scotia, just east of Halifax, and was incorporated as Elmsdale Lumber Company in the 1950s. 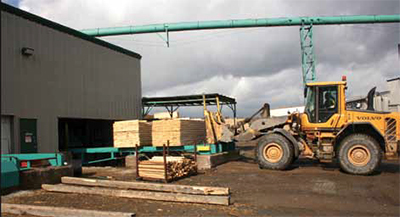 Elmsdale has operated continually since then, as a long lumber mill, with current annual production around 28 million board feet. The current management team is led by third generation owner and current president, Robin Wilber, and his son, Mark, sits in the vice-president position. Controller Gennie Himelman and General Manager Stephen Thompson complete the management team. Right from the front gate and business office, Elmsdale Lumber strikes visitors as being a very orderly operation. Even in early spring, with snow banks giving up their very last vestiges, the operation is neat and clutter free. The orderly status extends into the office environment, which is simultaneously very welcoming and business focused. The pavement around the mill and lumber piledown area adds to the orderly appearance, and that organizational effort extends to the well graveled log yard. While the industry downturn led to shutdowns and a number of mill closures across Nova Scotia, Elmsdale managed to keep operating without layoffs or extended shutdowns. Gennie Himelman points to three critical elements that allowed the mill to weather the downturn. “We have dedicated owners and managers who work in the operation every day, we have a versatile mill that can adapt to just about any customer request for dimensional lumber and we have developed a very skilled and engaged workforce who are focused on the business and the success of this company. “We take a team-based approach to production and business every day,” she added. Elmsdale Lumber starts the work week with a Monday morning supervisor’s meeting that brings together all the mill and yard supervisors—and their assistants—along with the management team and, notably, their lumber broker. Following the lumber broker’s report, the meeting expands into operations and the current order file, and any weather, machinery, delivery or safety issues. In addition to Monday morning management meetings, Elmsdale also conducts a pair of Wednesday meetings that engage the entire staff, Himelman explained. “We review our order book and general lumber markets, then open the meeting up to any subject, including safety, that employees want information about. These meetings give employees first-hand knowledge about what they are working on today, this week and in the future. Elmsdale has a formal safety committee, and it conducts quarterly safety audits of the entire operation. Safety committee members are selected from among the entire staff and are assigned to the committee for two years. The audits are guided by a comprehensive checklist and noted deficiencies or concerns are acted upon quickly. Himelman and General Manager Stephen Thompson both agree that their high level of employee engagement is a result of building skills and the knowledge capacity of their staff. Elmsdale endeavors to cross train all their employees for at least two stations in the mill and yard operations. It encourages their employees to switch stations at least once a day. Elmsdale has utilized employee surveys to measure job satisfaction and other work related matters. One question, specifically, asked what work station each individual employee would like to be trained for. With one survey, the work station training preference was followed by an open-ended question: What other training would you like to have? This led Elmsdale to a particularly interesting exercise. Elmsdale General Manager Stephen Thompson (right) says that the company’s high level of employee engagement is a result of building skills and the knowledge capacity of their staff. Elmsdale endeavors to cross train all their employees for at least two stations in the mill and yard operations. “About one quarter of our employees replied that they would like to complete a General Equivalent (High School) Diploma,” Robin Wilber explained. They were surprised with that response, but it really reflects that a lot of employees grew up and entered the workforce in a time when a High School education was not as important as it is today. “It was remarkable to see that a good percentage wanted the opportunity to achieve the goal of getting that level of formal education,” said Wilber. “We considered those results for just a short time before we contacted the Department of Education and gained their support to set up a program to work with our employees. The Department arranged for a teacher, and we set our boardroom up as a classroom and arranged for scheduled classes immediately following the work shift. Himelman added that Elmsdale has an ongoing vocational education program, focusing on employee knowledge about machines and processes, equipment operating procedures and even communication skills, both verbal and written. This even extends to effective (proper grammar) texting and e-mail communications. Employee engagement is also supported by a monthly newsletter, which includes a column written by their lumber broker, and columns by various supervisors and workers. Beyond the mill, family and events get included as well. Elmsdale has also built a succession plan into the supervisory and management positions in their business. Every supervisor and manager has an identified protégé, who is being trained and or groomed to step up to or into the position when the senior person retires. Each protégé shadows a senior person to gain a clear understanding of the responsibilities of the job. They get assigned ‘learning’ tasks, discuss issues and systems with their mentor, and get challenged with special projects or tasks. The succession plan will make the transition to a new generation of managers as seamless as possible. 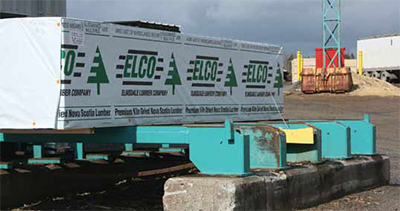 Elmsdale’s log supply is 90 per cent-plus spruce, and is mass-scaled using on-site scales in the paved yard. Truckers are provided with a security gate code, which allows 24 hour delivery. 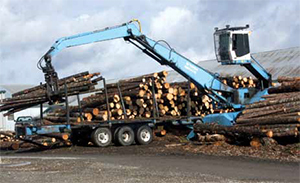 Most of the log trucks delivering wood are centre mount loader equipped, and the driver/operators know the log piles are sorted by length, and place their loads accordingly. Elmsdale has a Fuchs MHL460 grapple loader and triaxle yard trailer, in addition to a couple of loader-equipped tandem trucks for unloading other log trailers during operating hours. The Fuchs also feeds logs to the mill. “We have operated the Fuchs for about nine years, and it has given us good service. It provides versatility, visibility, reach and power. It has been a good machine for us,” commented Thompson. The Fuchs operator keeps in radio contact with the debarker operator, to make sure the right proportion of large and small logs are supplied to the infeed decks to supply the mill’s twin saw lines. The Forano debarker is a twin rotor design, that slides sideways in a frame lining up the log infeed with one of the two Cambio debarker heads. The smaller side handles diameters up to 18 inch and the larger side handles log diameters up to 30 inch. Elmsdale Lumber has a Fuchs MHL460 grapple loader and triaxle yard trailer, in addition to a couple of loader-equipped tandem trucks, for unloading other log trailers. The Fuchs also feeds logs to the mill. The large logs feed a Cardinal carriage and single cut PHL band saw. Small logs are handled by a PHL twin saw with 40 inch saws. Elmsdale staff have added top saws to the twin, which Thompson pointed out allows the twin to handle larger diameter logs, making the mill a little more efficient. Lumber from both saws feed to a nine-inch Valley Industries combination bull and board edger, which runs 26 inch saws. 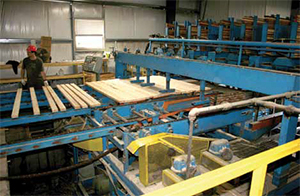 The edged lumber proceeds to a manual pull station, where trim and waste is directed to the chipper and low grade lumber (wane, defect) is sent back to the edger for remanufacturing. 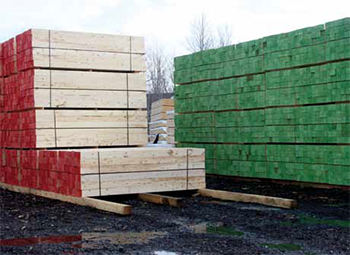 On most mill runs, Elmsdale assigns a lumber grader after the trim saws to identify lumber that will make their (long and short) clears, and other specialty products. 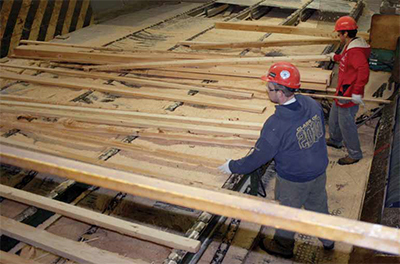 After the trim saws, lumber proceeds to a Carbotech 98 bin lumber sorter that went into operation in November 2010. On most mill runs, Elmsdale assigns a lumber grader after the trim saws to identify lumber that will make their (long and short) clears, and other specialty products. 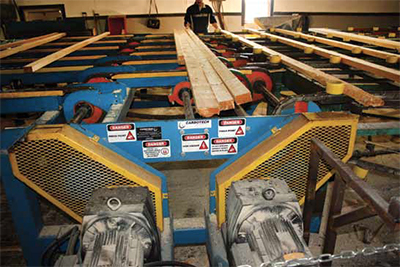 After the trim saws, lumber proceeds to a Carbotech 98-bin lumber sorter. A 150 horsepower KMW boiler provides steam to a pair of American Wood Dryer kilns that were installed in 1995. Each kiln has an 80,000 board foot capacity. The planer is a Yates model A15SK with hydraulic feed drives and electric heads that was installed in 1999. The planer mill also hosts a vintage Yates resaw. Planer shavings are fed to the KMW boiler and excess supply is marketed to the Shaw Manufacturing pellet mill. Elmsdale markets are primarily domestic, in Nova Scotia and the Atlantic Provinces, and some in to the U.S. as their housing construction recovery gains strength. Elmsdale owns some 28,000 acres of woodlands, which Gennie Himelman describes as an important strategic asset. “The woodland was a critical asset that helped us to weather the lumber industry downturn. When our fibre supply tightened up and lumber prices were very low, we were able to harvest more from our woodlands, but still within a reasonable level, to help keep the mill supplied. “It’s critical that we keep our harvesting in a sustainable window. We can’t exploit the wood supply too hard, or the resource will not there—and be available, when we need it,” emphasizes Himelman. Forest Technician Jason Casey and Operations Supervisor Greg Grant handle Elmsdale’s own woodlands management, in addition to the silviculture program they provide to wood suppliers. Beaver Dam Enterprises, a full range harvest contractor, operates Elmsdale woodlands and the stumpage contracts Elmsdale arranges with woodlot owners.